It could be a lincesed game from an unknow spanish company, Maybe PETACOS, IRECSA, other. I think it is a Exerion cabinet because spaceships are similar to original side art´s spaceship from TAITO. I have an original side art from TAITO too. I agree, the ship is very similar indeed. Nice piece of art, love the official side art too! Artwork original "EXERION SIDE ART" propiedad del espacio Zona Arcade y adquirida dentro del proyecto "ARCADE RECOVERY". "Exerion Side Art" (TAITO) scanned and restored by Zona Arcade & Mikonos. Details in "Exerion Side Art" (TAITO) scanned and restored by Zona Arcade & Mikonos. "Street Fighter Zero 3 Marquee" for SEGA cabinets. Restored by Zona Arcade & Mikonos. Details in "Street Fighter Zero 3 Marquee" for SEGA cabinets. Restored by Zona Arcade & Mikonos. "Street Smart Bezel" arcade artwork restored byy Mikonos. 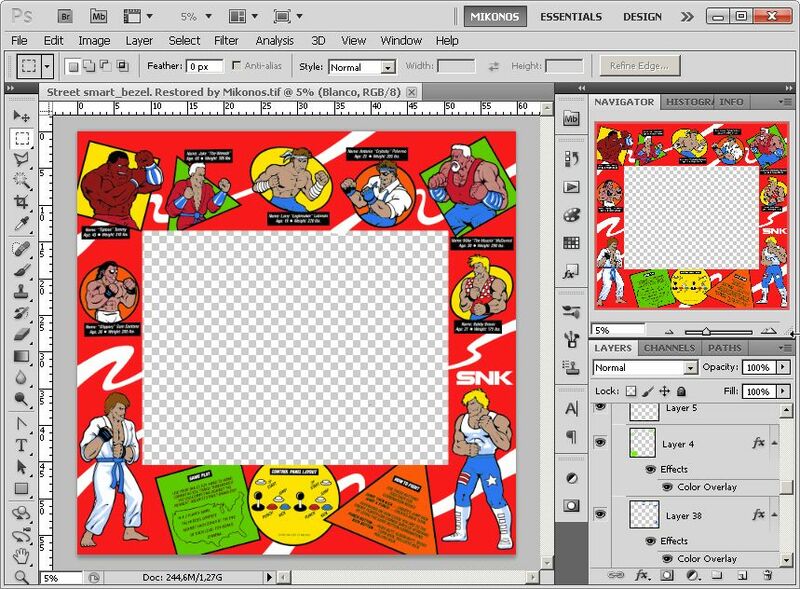 "Street Smart Bezel" arcade artwork comparison restored byy Mikonos. 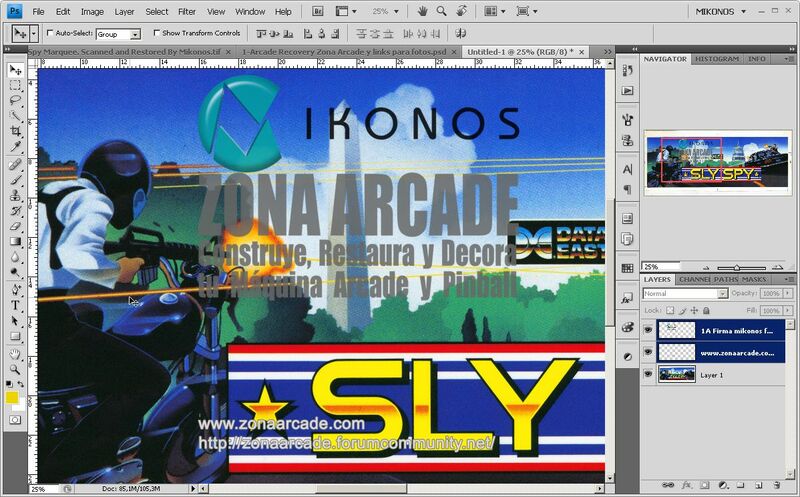 Artwork original arcade "SLY SPY MARQUEE" (DATA EAST) propiedad del espacio Zona Arcade y adquirida dentro del proyecto "ARCADE RECOVERY" (foto 1). 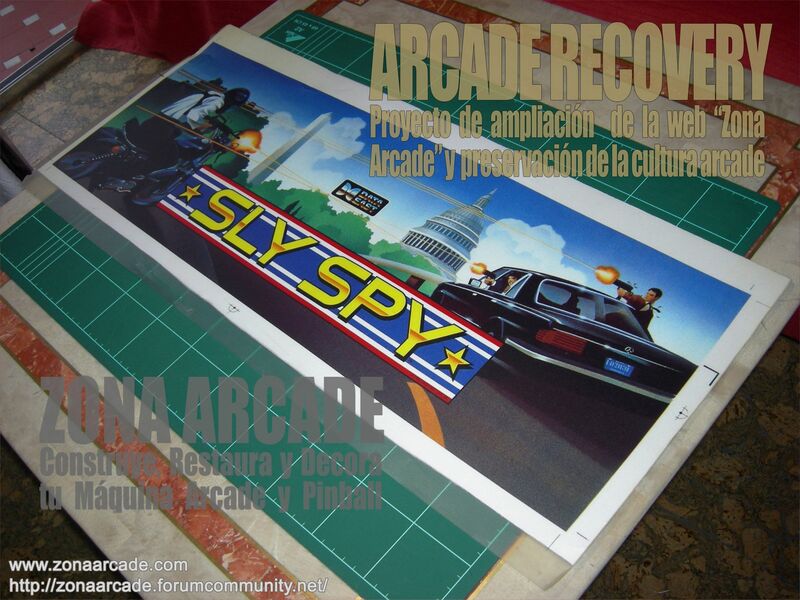 Artwork original arcade "SLY SPY MARQUEE" (DATA EAST) propiedad del espacio Zona Arcade y adquirida dentro del proyecto "ARCADE RECOVERY" (foto 2). 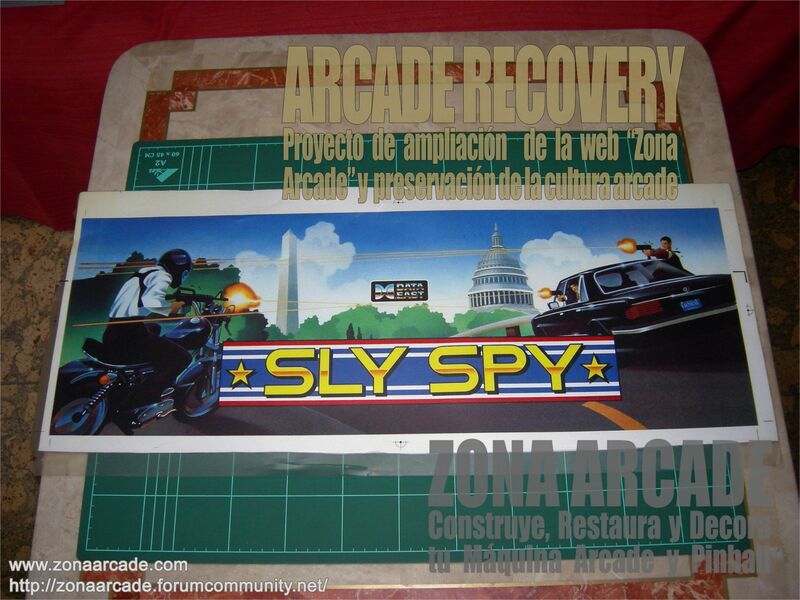 "Sly Spy Marquee" (DATA EAST scanned and restored by Mikonos for Zona Arcade web. "SLY SPY MARQUEE" details by DATA EAST. Scanned from original and restored by Mikonos. 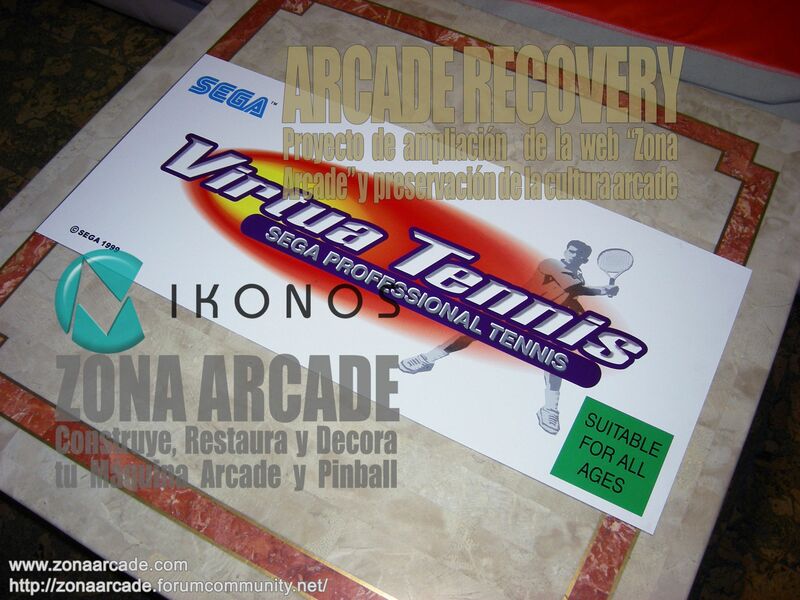 Original "Virtua Tennis Marquee" for upright cabinet property of Mikonos & Zona Arcade. Hi Mikonos, have you any artwork for Gevin Euro 40 Arcade (also called Megalo) like this one? Sorry for delay! 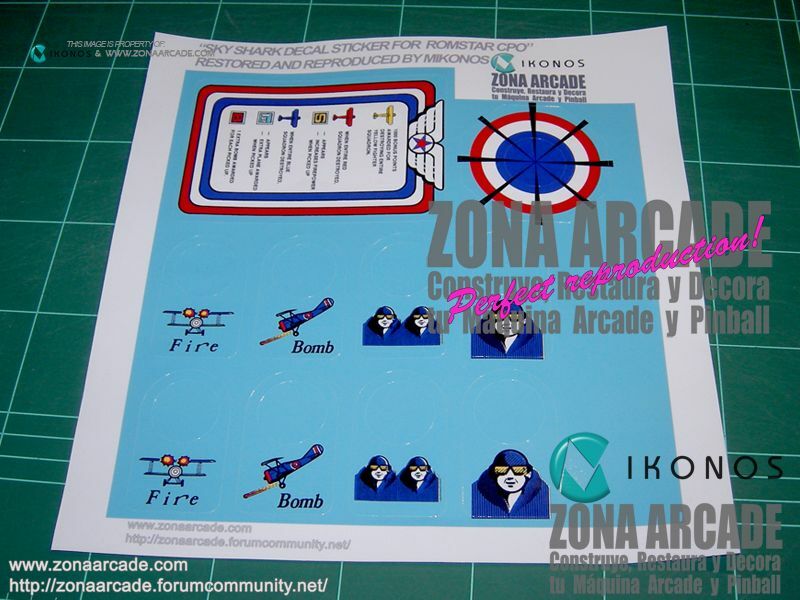 I haven´t artworks for this cabinet for now, but If you have your decals scratched, I would restore without problem. If you can not scan them, you can remove with a hot gun and send to me. I will restore them for free. "Virtua Tennis Marquee" (upright) scanned and restored by Zona Arcade & Mikonos. Details in "Virtua Tennis Marquee" (upright) scanned and restored by Zona Arcade & Mikonos. About painted artwork (serigraphy), there must be no problem, I would recomended to buy a scan machine than works in flat sufaces. Look, at start of this page Minwah user asked me for a table of my property with Exerion side Art design, I will not have problem to scan it. In fact, I will scan it along of this week. "Out Run Cabaret Bezel" (SEGA). Restored artwork by Mikonos & Zona Arcade. Out Run Cabaret Bezel (SEGA) printed in inverted vinyl with inside precut (photo 1). Out Run Cabaret Bezel (SEGA) printed in inverted vinyl with inside precut (photo 2). 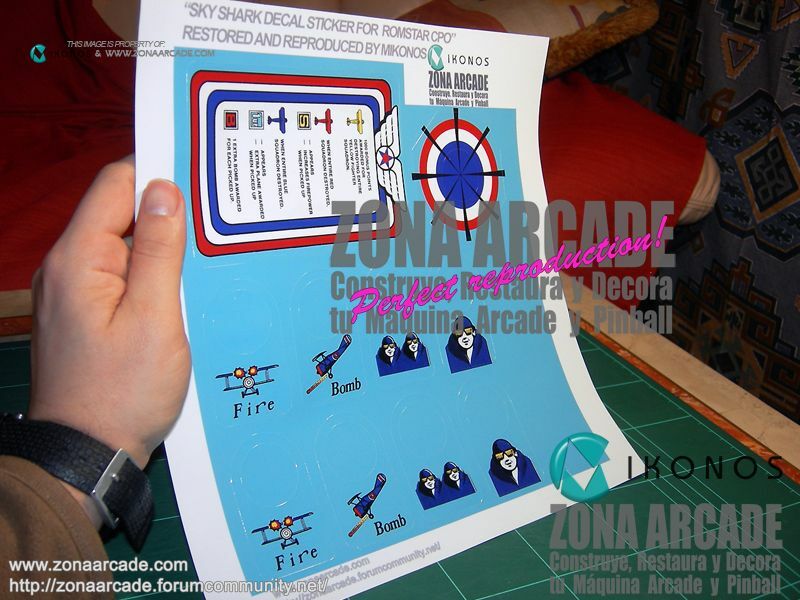 Arcade artwork "Sky Shark Decal Sticker" (ROMSTAR) printed in vinyl with gloss protective lamination and precut. Ready for stick! (photo 1). "Sky Shark Decal Sticker for Control Panel Overlay" (ROMSTAR) reproduced by Mikonos and printed in vinyl with gloss protective lamination and precut. (photo 2). My main attraction: Original "Ghosts and Ghosts Control Panel". This was the first piece of all Zona Arcade´s huge collection. It starts all! Original "Ghosts and Ghosts Control Panel" property of Zona Arcade (photo 1). Original "Ghosts and Ghosts Control Panel" property of Zona Arcade (photo 2). I post some photos from one of my user for who I have restored SEGA "Enduro Racer"
attached find the enduro racer cab with your sidearts. "Enduro Racer Cockpit Cabinet" with side arts reproduction from Zona Arcade & Mikonos (photo 1). "Enduro Racer Cockpit Cabinet" with side arts reproduction from Zona Arcade & Mikonos (photo 2).